Odeon Limitless is all about giving you the freedom to pursue your love of films in your own way. For a monthly fee of £17.99 a month (or a one-off upfront payment of £205, saving 5%) you will get to watch any film*, any time on any day as many times as you want! Imagine being able to see all the films you want, week in, week out. Mid-week romcom? Saturday night blockbuster? With huge potential savings and access to exclusive member treats, joining Limitless means you can watch all the films you want as often as you like for one monthly fee. 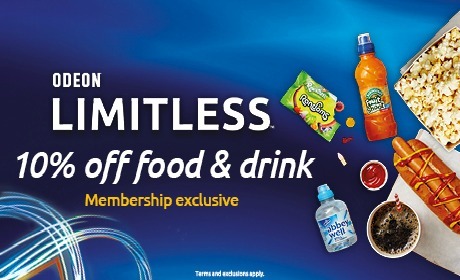 Every month Odeon Limitless holders will be rewarded with an exclusive retail offer. Discount is not valid on Candyking pick and mix or Costa products. Sign-up HERE or in-foyer and start enjoying your Limitless membership. *Terms and exclusions apply. Extra charge for some screenings and facilities. £17.99/month membership excludes Central London cinemas. Price including Central London cinemas is £19.99/month. Minimum age is 16, minimum membership period is 12 months, and monthly payment is by Direct Debit. See Central London cinemas list or for more details see 'Things you need to know'. Please note Limitless excludes Event Cinema screenings.